The Directors of Marlborough Gallery are pleased to announce the opening of an exhibition of Stephen Hannock’s recent paintings on October 13th with a reception from 6:00 to 8:00 p.m. The exhibition will continue until November 12th and will feature new large and small scale paintings which continue his signature exploration of light and landscape. The Directors of Marlborough Gallery are pleased to announce that Marlborough Gallery will be presenting a selection of works by artists Magdalena Abakanowicz, Santiago Calatrava, and Paula Crown at EXPO CHICAGO from September 22-25, 2016 at Booths 140 and 239. Summary: Marlborough Gallery will be presenting a selection of works by artists Magdalena Abakanowicz, Santiago Calatrava, and Paula Crown at EXPO CHICAGO from September 22-25, 2016. The Directors of Marlborough Gallery are pleased to announce an exhibition of new works by American artist, Paula Crown. The exhibition will open on September 13, 2016 with an opening reception at the gallery from 6 to 8 PM. It will remain on view through October 8, 2016. The Directors of Marlborough Gallery are pleased to announce an exhibition of new paintings by the renowned Spanish artist Juan Genovés. An opening reception will be held on Tuesday, September 13th from 6 – 8:00 pm. The exhibition will remain on view until October 8th. Born in Valencia in 1930, Genovés is one of Spain’s best-known contemporary artists. He is recognized for work rooted in Social Realism and Pop with a distinctly critical voice that advocated for political change during the Franco regime in Spain. The Directors of Marlborough Gallery are pleased to announce that Marlborough Gallery will be presenting artist Dale Chihuly's newest creations in glass and neon at the Seattle Art Fair from August 4-7, 2016, at Booth D13. Summary: The Directors of Marlborough Gallery are pleased to announce that Marlborough Gallery will be presenting artist Dale Chihuly's newest creations in glass and neon at the Seattle Art Fair. The Directors of Marlborough Gallery are pleased to announce the public exhibition of six new monumental sculptures by the acclaimed Spanish artist Manolo Valdés at Place Vendôme in Paris. Located in the 1st arrondissement, the site will serve as an architectural setting for the group of sculptures by Valdés: female heads in aluminum, iron or marble, their unique ornamentations on unforgettable display. The new works, all of which were created for the exhibition at Place Vendôme, depict beautiful, stylized women in the artist’s well-known signature style. Valdés, famous for depictions of women in all media, has created some of the largest and most expressive three-dimensional portraits of his storied career. One sculpture, La Pamela, wears a wide-brimmed hat and stands 16-feet tall. Another entitled Los Aretes, is 19-feet long and depicts a woman with earrings that are as large as her head, all in strikingly bright blue iron. La Mariposa is the latest version of one of Valdés’s favored thematic presences: the butterfly. The featureless female in this monumental sculpture sports an enormous butterfly on her forehead, a headdress that is a symbol not only of inner beauty but also creativity. The blue iron visage in Mariposas is adorned with dozens of massive butterflies in a sculpture that is as uplifting as it is profound. In additional to technical mastery, his sculptures exude deep passion for history and for humanity. His monumental women are familiar but distinct, imposing yet alluring. The works will remain on view through October 5th, 2016. Summary: The Directors of Marlborough Gallery are pleased to announce the public exhibition of six new monumental sculptures by the acclaimed Spanish artist Manolo Valdés at Place Vendôme in Paris. The Directors of Marlborough Gallery are pleased to announce that Philadelphia Cornucopia, Red Grooms’ renowned 1982 sculpto-pictorama, will be shown for the first time in nearly 30 years as part of the exhibition Happiness, Liberty, Life? American Art and Politics at the Pennsylvania Academy of the Fine Arts, open to the public today, June 30th. The exhibition will coincide with the 2016 Democratic National Convention. Philadelphia Cornucopia was commissioned by the Institute of Contemporary Art in Philadelphia for the city’s tri-centennial celebration in 1982, following the artist’s groundbreaking 1977 exhibition in New York City: Ruckus Manhattan. Although some of the original elements have been lost, after a six-year restoration effort the installation will feature George Washington, Benjamin Franklin, and Thomas Jefferson. When Philadelphia Cornucopia was first shown at the Institute of Contemporary Art at the University of Pennsylvania, the 2,000 sq. ft. sculpto-pictorama made such a strong impact on the public that a small group of enthusiasts were able to raise the funds to acquire the work in order to donate it to the city of Philadelphia. The work was on display at the old Philadelphia Visitor Center from 1982 to 1986 and at 30th Street Station from 1987 to 1989. In 2010 Philadelphia Cornucopia was given to the Pennsylvania Academy of the Fine Arts with the hope that it could be restored and displayed once again. Summary: The Directors of Marlborough Gallery are pleased to announce that Philadelphia Cornucopia, Red Grooms’ renowned 1982 sculpto-pictorama, will be shown at "Happiness, Liberty, Life? American Art and Politics" at the Pennsylvania Academy of the Fine Arts. Summary: The Directors of Marlborough Gallery are pleased to announce the addition of South African-born, U.S.-based painter Peter Sacks to its roster of artists. "Bill Jacklin: The Graphic Work 1961-2016" at the Royal Academy of Arts in London is the first ever retrospective of Bill Jacklin’s graphic work. It includes his experiments with etchings in the 1960’s through to monotypes newly created for this show. The subjects Jacklin depicts range from intense studies of his dying father to joyous representations of his adopted home – New York, the city he moved to 30 years ago. His themes are people, light and movement, whether the bustling crowds of Grand Central Station or skaters in Central Park. At the heart of Jacklin’s work is draughtmanship; as he explains, ‘it is the conduit through which I see the world’. Through drawing and experimenting with many different print techniques Jacklin captures the light and atmosphere of his subjects, always looking, he says, ‘for the magic’. Learn more about the exhibition on the Royal Academy of Arts website. To buy the 'Bill Jacklin: Graphics', published on the occasion of the exhibition click here. Summary: "Bill Jacklin: The Graphic Work 1961-2016" at the Royal Academy of Arts is the first ever retrospective of Bill Jacklin’s graphic work. Bill Jacklin and the Directors of Marlborough Gallery invite you to a book signing in celebration of two new monographs. Bill Jacklin's New York published by Scala Arts Publishers with a foreword by Sting and an interview by Michael Pepiatt, and Bill Jacklin: Graphics, published on the occasion of the exhibition Bill Jacklin RA: The Graphic Work 1961-2016 at the Royal Academy of Arts, London, June 3-August 28. The signing at Marlborough Gallery will be Wednesday, June 15, 2016 from 6 to 8 o'clock in the evening. 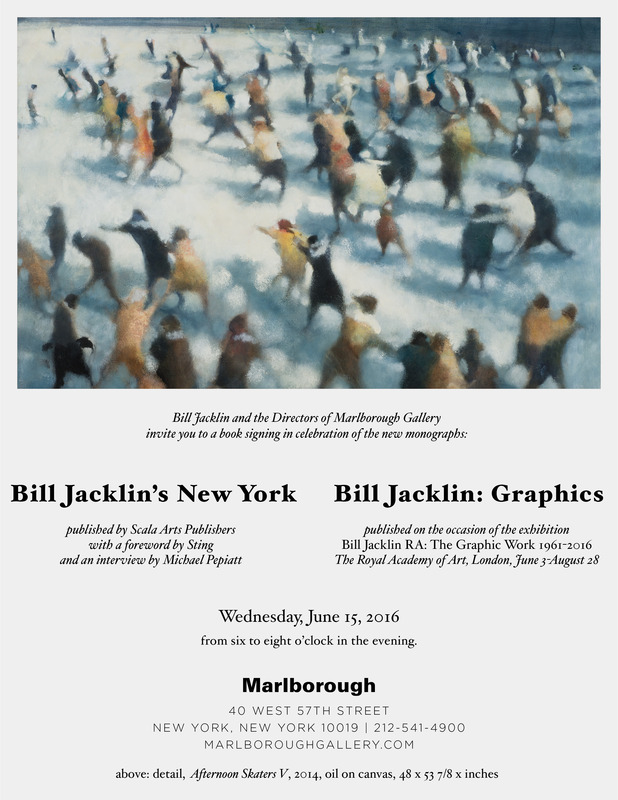 Summary: Bill Jacklin and the Directors of Marlborough Gallery invite you to a book signing in celebration of two new monographs.